Unheralded coming out of college, Davis was taken by the Broncos in the sixth round of the 1995 NFL draft and emerged to rush for 1117 yards and catch 49 passes. In 1996 he ran for 1538 yards to lead the AFC and was named NFL Offensive Player of the Year by the Associated Press as well as being a consensus first-team All-Pro and selected to the Pro Bowl. Broncos went 12-4 to finish second in the AFC West and qualified for the postseason as a Wild Card while leading the NFL in total yards (5872), touchdowns (55), and scoring (472 points). Won AFC Wild Card playoff over Jacksonville Jaguars (42-17), AFC Divisional playoff over Kansas City Chiefs (14-10), AFC Championship over Pittsburgh Steelers (24-21) & Super Bowl over Green Bay Packers (31-24). 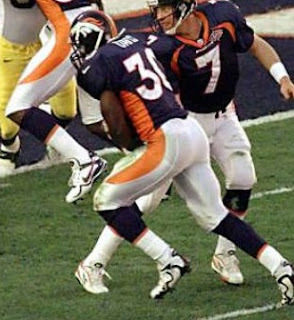 Davis rushed for 2008 yards and 21 touchdowns in 1998 and received consensus league MVP honors while the Broncos repeated as NFL Champions. But after rushing for 6413 yards in four years, Davis gained just 211 yards on the ground in ‘99 as he sustained a major knee injury in the fourth game. Returning in 2000, he struggled, appearing in only five contests and rushing for 282 yards. Davis ran for 701 yards in one last injury-riddled season in 2001. For his career, he gained 7607 yards on 1655 carries and added another 1280 yards on 169 pass receptions. Davis was a consensus first-team All-NFL selection three times and was selected to as many Pro Bowls in his short but productive career. He is probably in the HOF today if not for that 99 injury. He may still make it.